If you’ve watched the Thailand episode of Anthony Bourdain’s No Reservations, then you are familiar with the Mae Klong Railway. This tiny single track line runs from the west side of Bangkok, completely detached from the rest of the State Railway network, to Mae Klong in Samut Songkhram province. Along the way the line ends on one side of the river in Mahachai in Samut Sakhon province and you have to take a ferry across the river to resume your journey. A highlight of the journey is the last few hundred meters of the line, which run right through the center of the Mae Klong wet market. Vendors scurry to pull back their trays, tables, and canopies so the train can pass through. No sooner has the train passed then the vendors slide everything back out, just like a giant zipper closing along the tracks. The reason I took this journey, besides the fact that I’ve heard about it for several years and been curious to take it, was to evaluate its suitability for some guests who will be arriving in the coming months. The terminus of the railway is just a short drive from the Amphawa nighttime floating market, about which I’ve written several times (here and here). The idea is that I could combine this train ride with a visit to the floating market, and then catch a bus or van back to Bangkok. Right: Fellow traveler on the Mae Klong line. For this adventure, I invited Bill, an American who moved here recently. He’s spent extended periods here before and I know he has a taste of adventure. In fact, he was here during the September 2006 coup and went out to shoot some great nighttime photos of the tanks. He seemed well suited for what could potentially end up as a “and how do we get home?” sort of adventure. The first challenge is that the train to Mae Klong departs at a tiny neighborhood station in Thonburi, on the west bank of Bangkok’s Chao Praya River instead of at the main Hualamphong Station. Thankfully, six months ago the BTS Skytrain opened an extension across the river and the current terminus station is at Wongwian Yai, just a fifteen-minute walk (or five-minute taxi ride) from the Wongwian Yai Railway Station. You would be forgiven if you miss the station, which is located down the soi (alley) on the left with the small white sign. In the distance is a large traffic circle, in the center of which is a statue of King Taksin (not the same spelling or pronunciation as the former Prime Minister Thaksin), the only king who ruled Siam from the capital here in Thonburi. 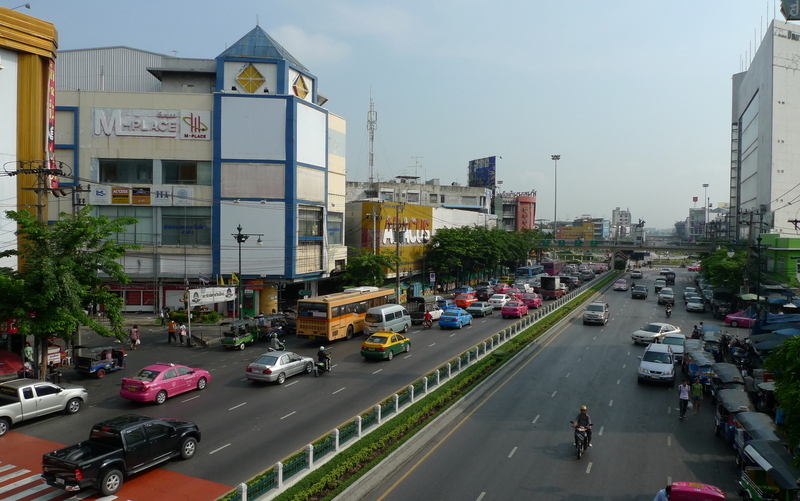 The capital was in Thonburi only 15 years before Taksin’s successor, King Rama I, moved the capital to the east bank where present-day Krungthep (Bangkok) is. 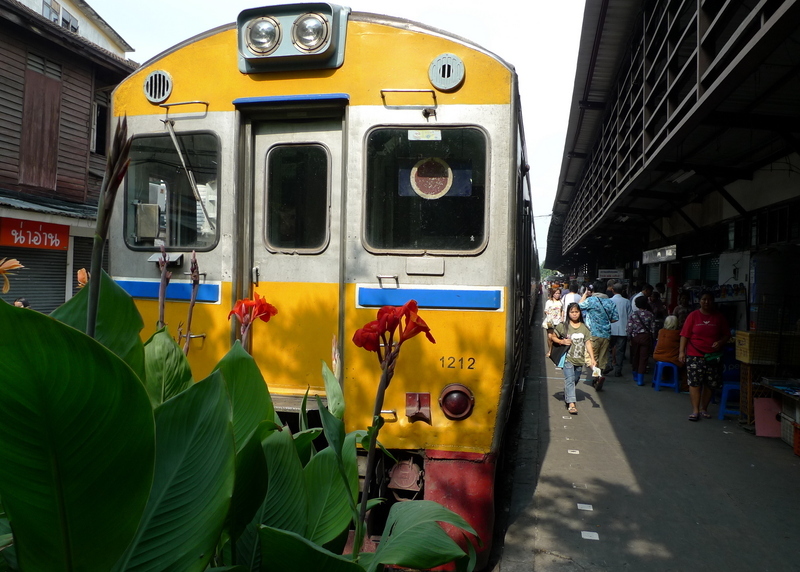 The train sitting in Wongwian Yai Station with beautiful tropical foliage at the end of the line. 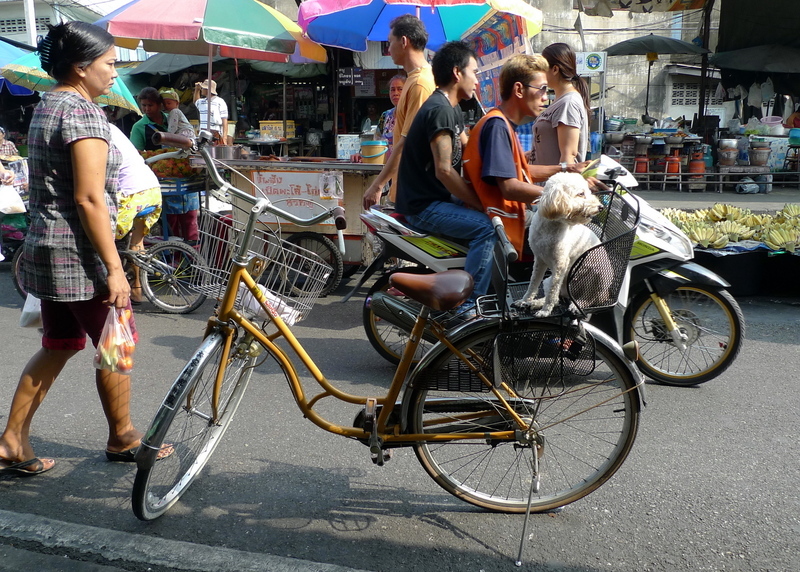 Like all the terminal stations on the Mae Klong line, Wongwian Yai station is located in the midst of the market area. Rows of vendors sell all sorts of fresh goods and other vendors sell food and drink to the locals and the commuters. 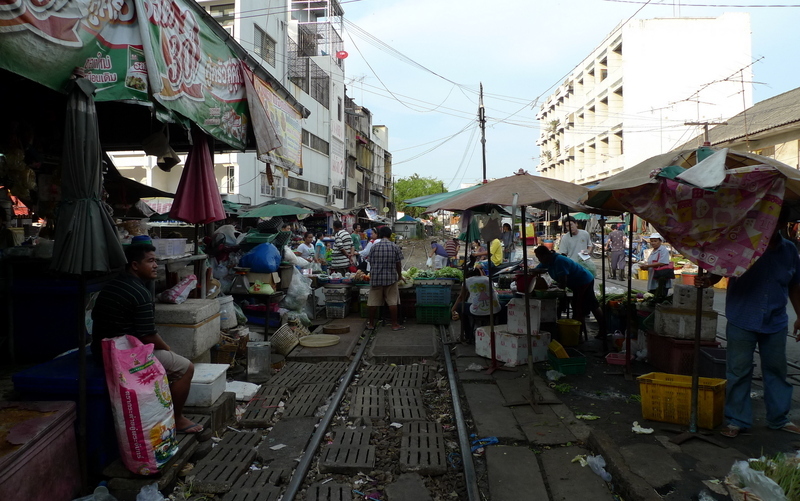 Despite this being a small, single-track line, it carries a lot of traffic including commuters into the city as well as both shoppers and sellers on their way to and from the market. An hour and about eight stops later, we arrived in Mahachai, the local name for the administrative seat of Samut Sakhon province. Here, too, we found a market surrounding the station. But in this case it was starting to spill over, with vendors who had to move each hour as the trains arrive and depart. 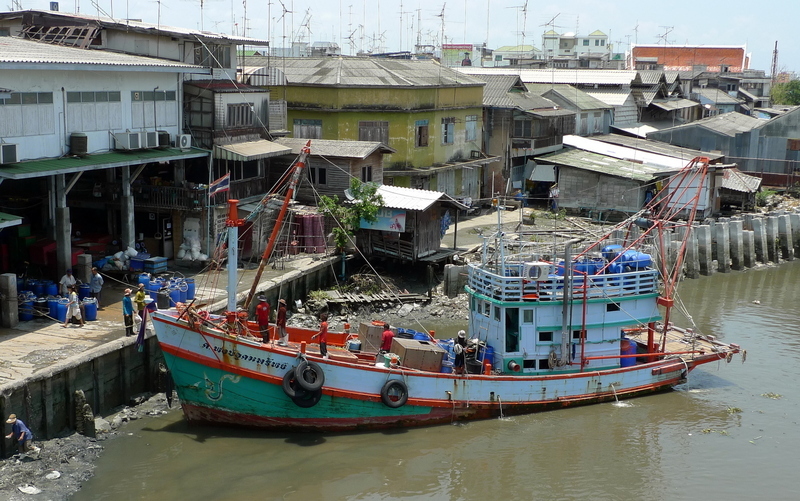 Samut Sakhon is mostly a fishing town situated on the Tha Chin Klong River, which opens into the Gulf of Thailand. There is a large fishing fleet which brings in large catches of many different types of seafood, most prominently the local delicacy plaatoo – mackerel. A short walk from the Mahachai train station is the main ferry pier and next to that is a prominent six- or seven-story seafood restaurant. My friend Stuart, who has done this trip twice before, suggested a stop here for lunch and since we had about three hours between trains (the trains on the second line run just four times a day versus hourly on the first line), Bill and I decided to try it. The top several stories are air conditioned but there was a wonderful breeze so we opted to sit in one of the open-air seating areas. What beautiful weather for enjoying a fresh seafood meal. Here’s what we had – way too much food for just two people! 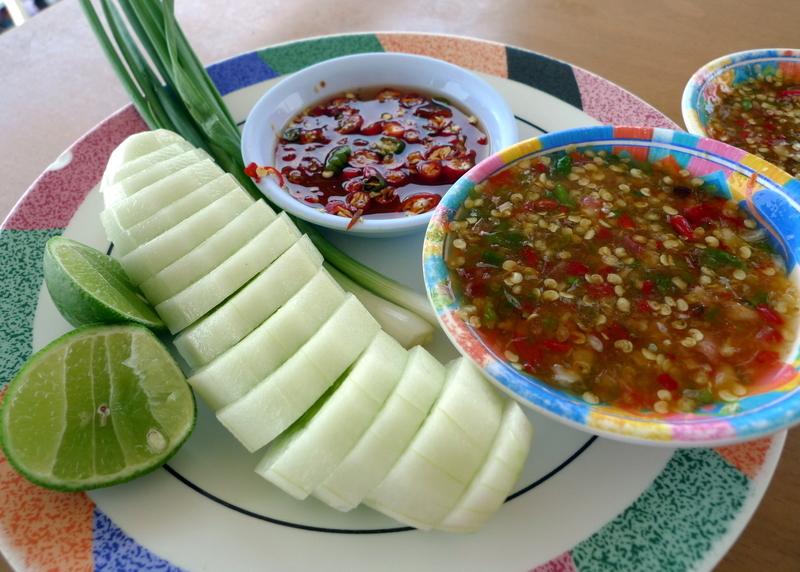 Typical condiments: lime, green onions, cucumber (to cool the spice), fish sauce with chili (small dish) and seafood dipping sauce which is made from tons of chilies, fish sauce, lime juice, and palm sugar, all blended together. 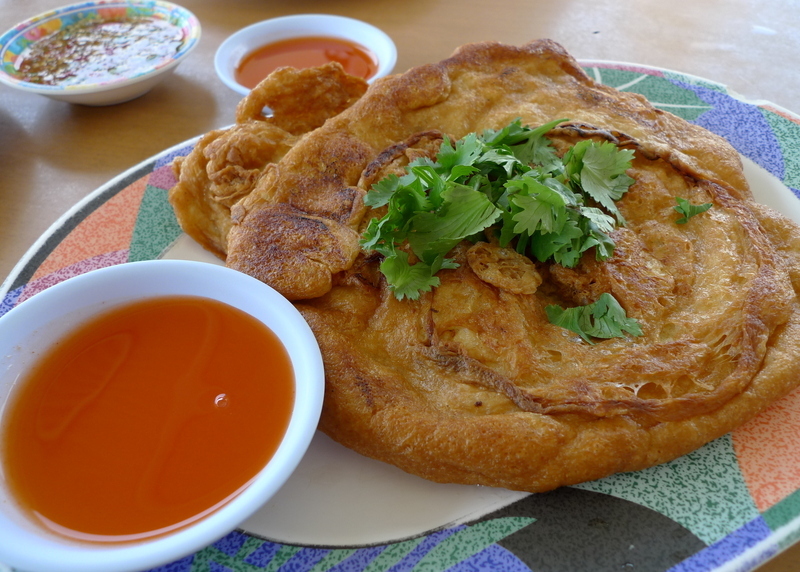 Deep fried omelet with crab meat. Sweet chili dipping sauce. 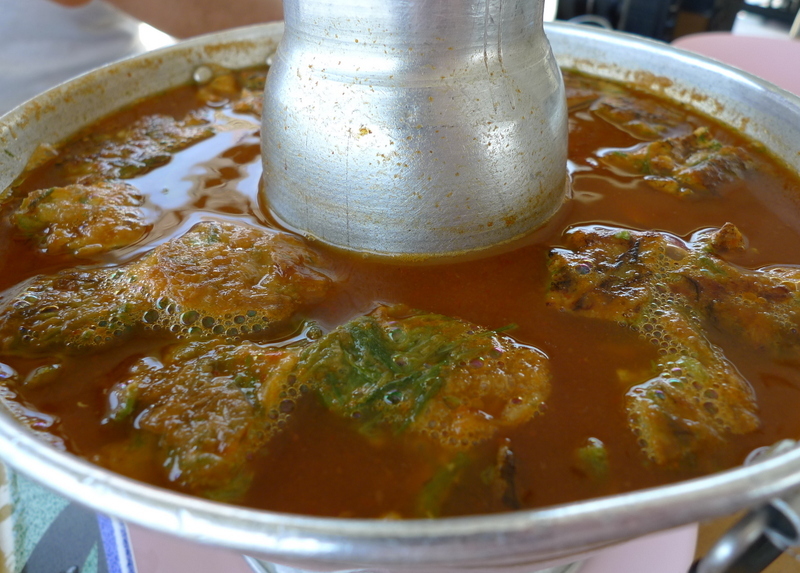 Gaeng Som – orange soup, moderately spicy and made with tamarind paste. 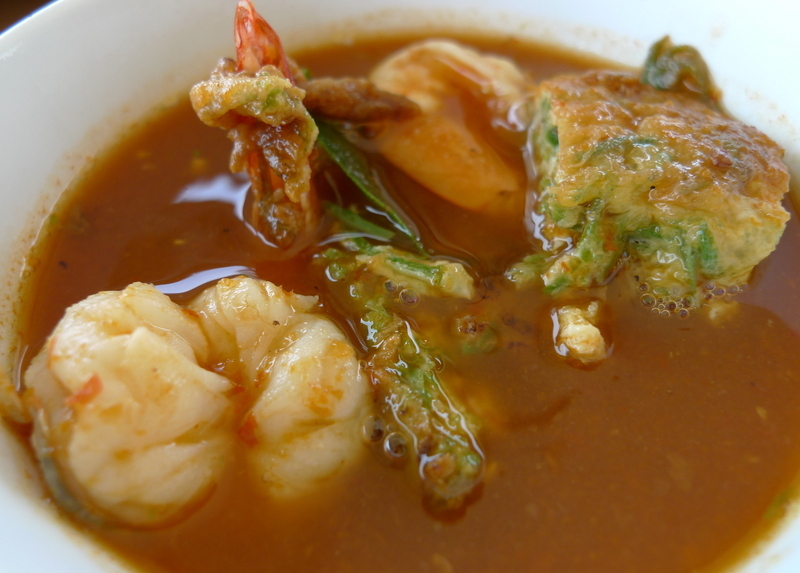 Closeup of the soup, with shrimp and pieces of omelet made with a strong-flavored green that grows along the river banks. Has the same effect as asparagus. 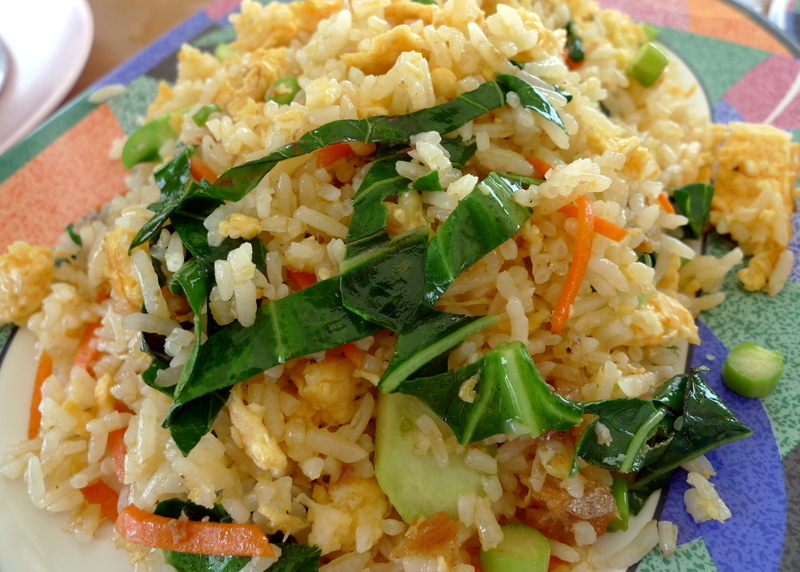 Fried rice with salted fish and crab. 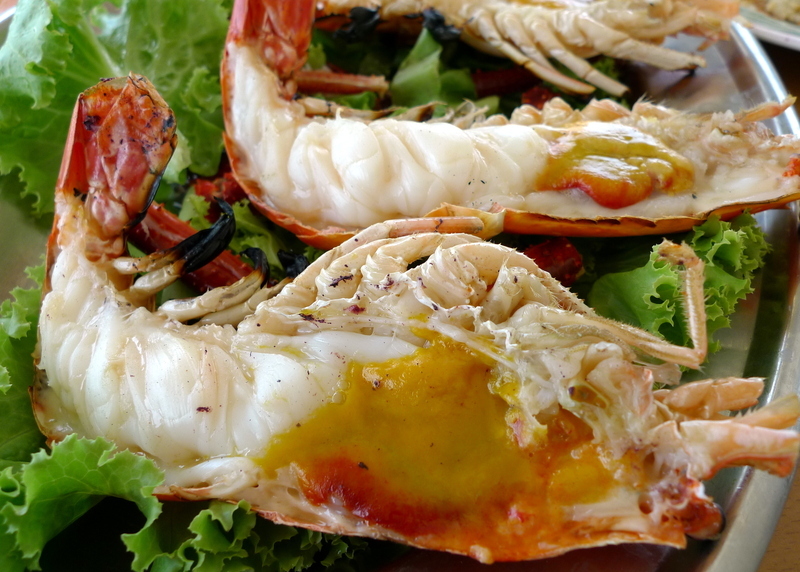 The big finale were two large grilled river prawns with some of that super-hot dipping sauce from the first picture. So fresh! How fresh, you ask? Right out of the tank and onto the fire. Now that’s fresh! Want to take a guess at the price of the meal? 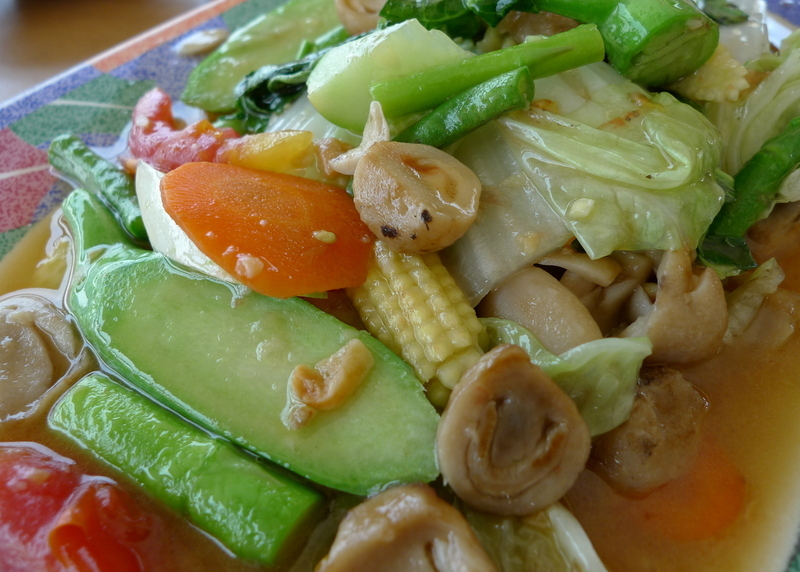 All that food (plus beer for me) was 1100 baht – about US$34. And I think about half that price went just for the prawns. Wow, what a great meal. 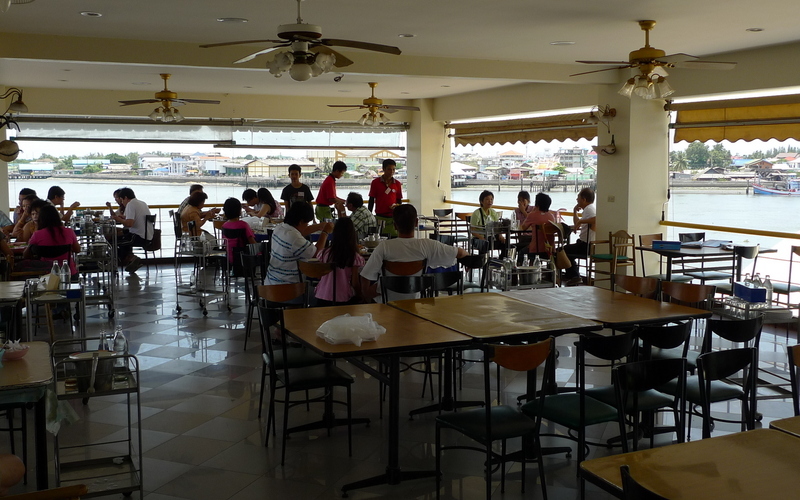 After the meal we headed out to find the ferry to the Ban Laem train station on the far side of the river. It turns out that the main ferry departing from the pier adjacent to the restaurant will drop you on the correct side of the river, but several blocks from the train station. The ticket attendant indicated that there was another ferry we could take, motioning behind the restaurant. Bill and I headed around the building, past a warehouse where fish were being processed, and found this really rickety looking pier with a small ferry docked at it. We boarded and asked the few people sitting on the ferry if the ferry was going to Ban Laem Railway Station. They nodded. I tried to pay my fare and they laughed and said that they were passengers, too. A few minutes later it became clear who the captain was as he stuck his head into the engine compartment at the rear of the boat to fire up the engine. His dog, seemingly high on caffeine, was running around the boat like crazy, wrestling with the mooring line. It took about ten minutes to slowly chug our way up the river. The west side of the river at this point is actually a bulbous isthmus, so while it took a lot of time, we weren’t really covering much ground. Looking at the map later, I think we would have been fine to take the main ferry and then just walk a few blocks to the train station, but no matter. The view was pleasant. 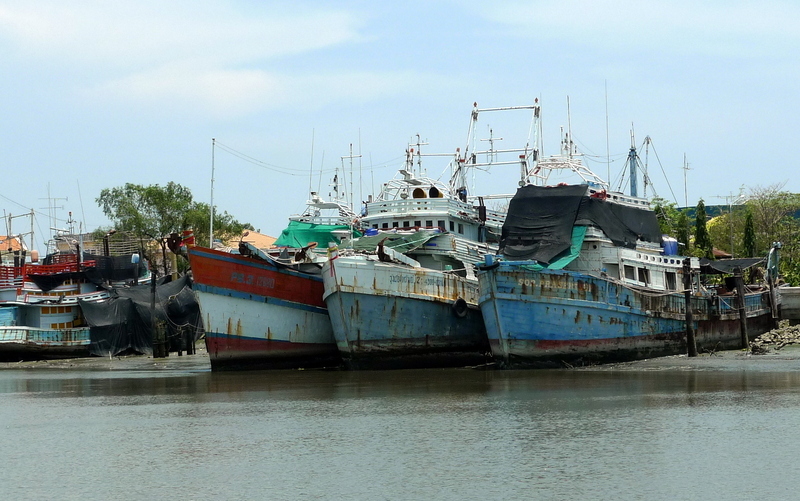 The tide was out and any number of fishing vessels sat on the mud, their vibrant colors fading in the sun. 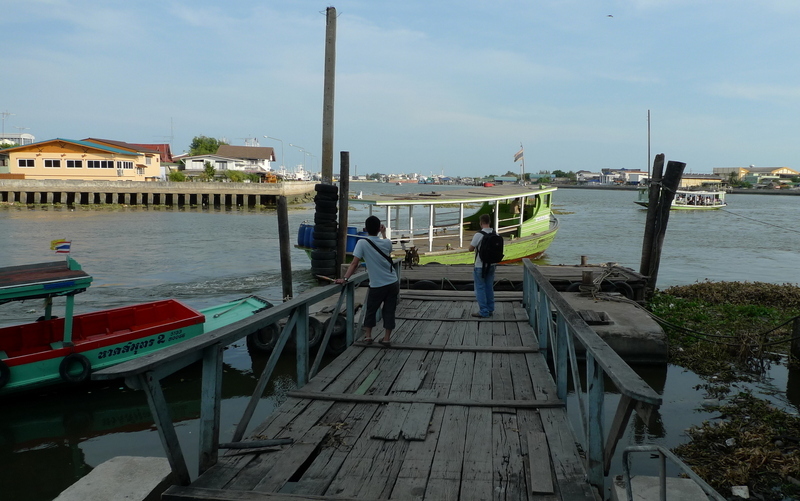 As we pulled up to the pier in Ban Laem, it wasn’t clear how we were going to disembark as the pier was fully out of the water. The captain nudged the bow of his boat up to the pier and we clambered off over the bow, landing on more rickety wooden decking. In this picture you can actually see one of the trains at the station, right below the temple’s roof. Talk about integrated transit – the train line ends right next to the boat pier. The hour journey from Ban Laem up to Mae Klong was a lot less comfortable than the first segment from Bangkok. The tracks seemed less even and we were rocking and rolling. 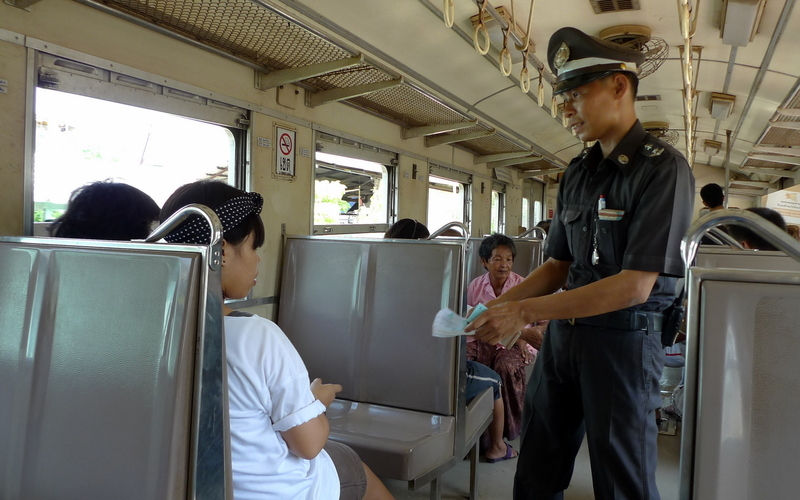 The train filled as we approached Mae Klong, so there wasn’t any room to spread out. We were getting tired and weary from the heat and the endless salt evaporation ponds made for monotonous viewing. As we pulled into Mae Klong, we passed through what seemed to be a forest of canvas as the market vendors’ awnings were pulled back, making walls that nearly blinded us as we rolled through. From were we were sitting, we couldn’t see the vendors themselves. Upon our arrival we had one hour before the train – the last train of they day – headed back. We did a quick walk around downtown Mae Klong, a town I’m actually pretty familiar with as it is the administrative seat of Samut Songkhram, the province in which I spent more than a year volunteering as an English teacher at a small elementary school. We were back about twenty minutes before departure and had to fight to get some seats. Everyone wanted to be on the last train of the day, it seemed. On the way into Mae Klong, I noticed that some other tourists (Thai tourists, though) were at the back of the train taking pictures out the open rear door. A few minutes before we headed out, I decided to go to the back of the train (which had been the front of the train when we arrived) and see if I could open the door to take pictures of the market as we passed through it. I couldn’t open the door – it seemed fixed shut – but some of the local ladies sitting at that end of the train engaged me in conversation and told me to go ahead and sit in the engineer’s compartment. Not sure if I should or not, I decided that “they told me I could” was an adequate excuse and went ahead and sat down. Carefully holding the camera out the window while looking in the rearview mirror for any obstacles that would slice off my hand, I filmed our trip out of the station and through the market. It was amazing, watching the vendors push their trays and wares and awnings back in place not two seconds after the train had passed. As I wrote earlier, it was just like a zipper closing up over the railway tracks. Next time I take that train I’m going to figure out how to open the door so I can get a good view of it. The ride home was anticlimactic. We had seen the landscape before and including the three-hour layover the entire journey had taken more than eight hours. My conclusion is that doing just the first half of the trip is probably plenty – take the train out to Mahachai for lunch and then take it back. 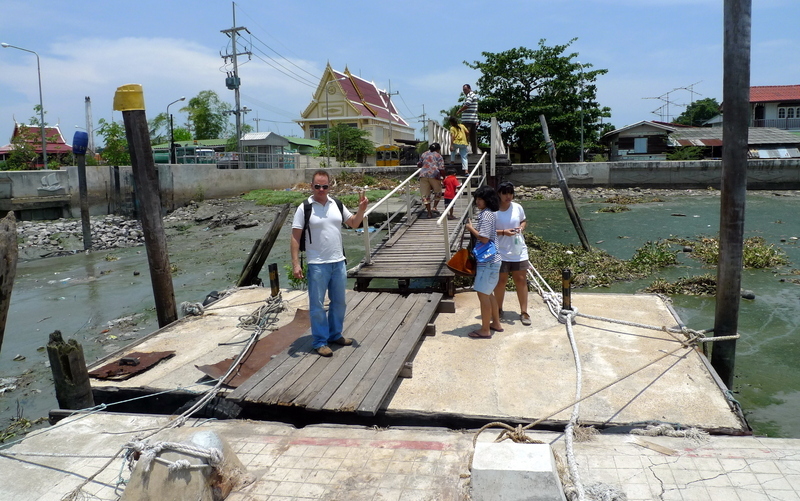 Samut Songkhram province and the Amphawa floating market is best reached by car or van. 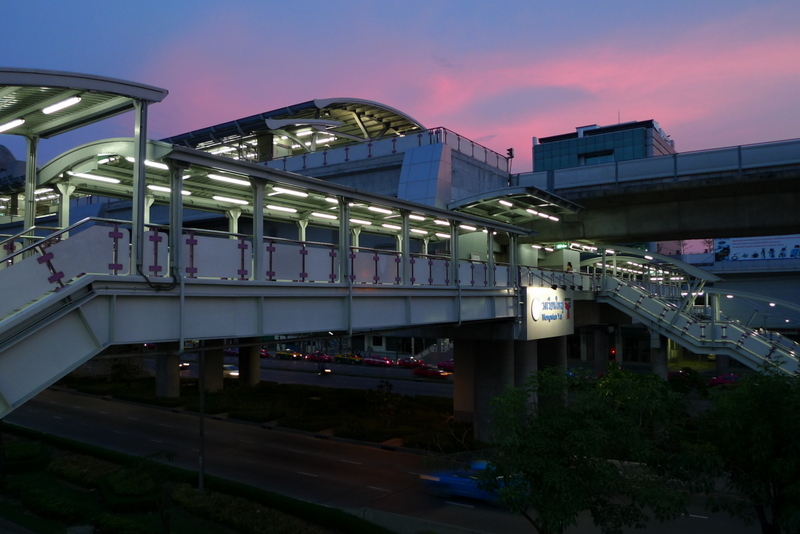 By the time we made it back to the Wongwian Yai Skytrain station, the sun had set and a beautiful early evening sky glowed above the city. Another fun and exciting adventure in Thailand. This entry was posted in Uncategorized and tagged Ban Laem, Bangkok, Mae Khlong, Mae Klong, Mahachai, rail, Railroad, Railway, Samut Sakhon, Samut Songkhram, Thailand, train, travel by christao408. Bookmark the permalink. You have all the fun Chris! I would love to eat that kind of food. yum. Great video… I enjoyed the entry as usual (perhaps more so, as I’m working from home today). I love the shots of the market. I’m always nervous about eating street food when I’m traveling but I am guessing with the open air kitchen, you can see how everything is prepared. O boy those prawns are HUGE!! !So good! your posts always make me so hungry to come for another visit to asia. your little train ride reminded me so much of jarkarta, indonesia the scenery is so similar but the market over the railroad tracks was a new sight. thank you so much ! Those are the biggest prawns I’ve ever seen! I read this at work but had to come home and reread and watch the video. The train trip looks interesting but I don’t think I’d be able to get my husband to do it – he gets motion sickness and that train would do him in. 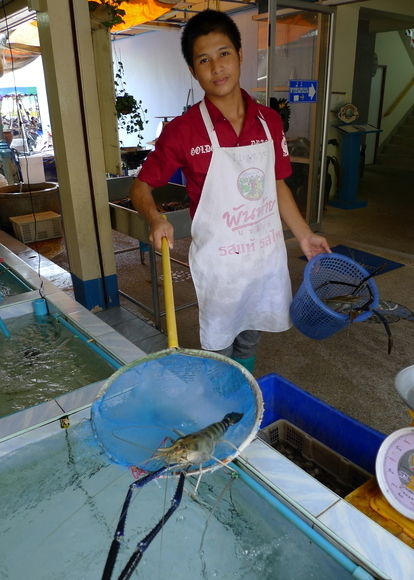 Not even the promise of a fresh prawn the size of a lobster would entice him. The zipper effect of the market was pretty amazing. Doesn’t the train damage the produce that is so close to the tracks? @murisopsis – It seems that there is minimal produce damage because the trays are on little rails that slide back away from the train track. There are probably a few pieces of collateral damage, of course. @beowulf222 – Oh, your contempt for the island nation you live in is thinly veiled Nick. Oh, speaking of which, you free for lunch on June 2nd? I’m doing a border run. @grannykaren – I’m so glad you enjoyed the entry. You certainly should travel again to Asia – lots to explore here. @secade – Get me a production team and a real camera!!! @yang1815 – Yeah, they are giant. @Wangium – I can relate to that; have the same experience each time I go back to the US. @ElusiveWords – For the most part, I didn’t eat much street food but instead ate at a proper restaurant. When eating street food, I mostly limit myself to items cooked in a wok, since the heat is much more likely to kill the bugs. Of course, even as I write those words I think of the sticky rice and mango, the green papaya salad, the fresh fruit, and other things I buy regularly from street vendors that aren’t wok-fried…@ZSA_MD – Well, come visit! Do you eat shellfish, though? @CurryPuffy – Actually, I relate to the Rick Steves concept, the whole seeing things the local way really appeals to me, although I’m not keen on backpacking. Rollaboard suitcases are beter. I love the video!Thank you and keep it coming, please :). @Redlegsix – Why not take a cruise over here? Might take a few months but you’d get here eventually? @pukemeister – Really? Allergic to fish? Yeah, I’d recommend against it, then…@bejewel07 – I will. There’s two more shot that just need to be edited. Glad you enjoyed. @grannykaren – Excellent! Taiwan is a neat place. I’m sure you’ll enjoy. @christao408 – yeah, my mother was too. That was a fantastic railway ride!!! Thanks for letting us “tag along”. Oh, the spicy fish sauce, makes me drool (despite that I just have my lunch), and I’d love to try the Gaeng Som!!!! @icapillas – Gaeng Som is one of my favorites. Usually only moderately spicy but with really rich tangy flavor. Glad you enjoyed the entry. nice pics and well-put together post. Thanks for sharing your train ride. @babydot74 – One of the one million sold already, huh? Congratulations! =D@Texana – Glad you enjoyed it. Thanks for stopping by and commenting.